The Malden High School Band welcomed the Christmas spirit at their annual Winter Concert in the Jenkins Auditorium on December 13th, 2018. The Concert Band, Small Ensemble Groups, Wind Ensemble and Jazz Band had been learning and practicing their music since October. This was the first winter concert with two different band groups performing, as well as the Small Ensembles groups. Band director Erin Mazza gives opening remarks. Photo by Brandon Wong. The concert started off with four pieces by the Small Ensemble groups, performed with a wide variety of instruments from the electric guitar to the marimba. Senior Vincent Truong, who played the box drum during the performance, added that he “learned [how to play] a week,” prior to the concert, due to the fact that the piece in question was a last minute addition to the concert. Though this was his first concert, Truong expected the concert to run smoothly, and, in the end, he concludes that his expectations were met. Followed by the Small Ensemble performance was the Jazz Band’s performance of “Take The ‘A’ Train.” Afterwards, the Concert Band performed three songs, one of which, “Dreidel Adventures,” student conductor Ari Cohen took the stage to direct. During the second and third song, Cohen joined his fellow concert band members as Mazza took over and directed their performance of “Three Minute Nutcracker” and “A Crazy Mixed Up Christmas”. Midway through their performance of “A Crazy Mixed Up Christmas,” the band stopped playing and all reached under their seats to grab santa hats and reindeer headbands to enhance the experience and heighten the Christmas spirit in the auditorium. There were also many short pauses during their performances; at one point someone dropped a small chain and the entire band stopped playing and glanced back and continued to play afterwards. 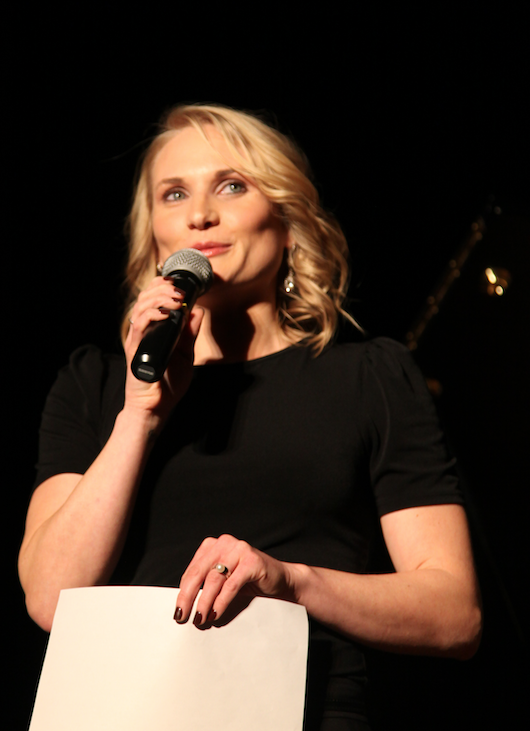 Mazza explained that “[she] asked the students to be creative and come up with different comedic” acts to do during their songs to add a humorous factor to their performances. 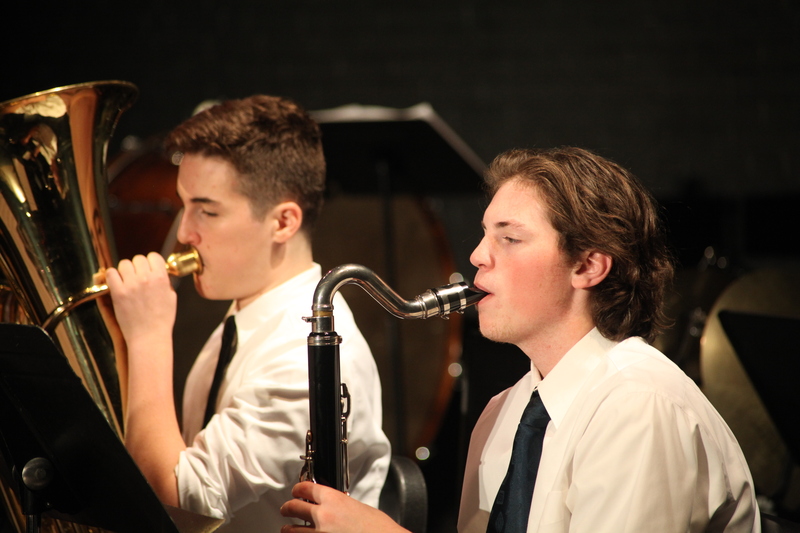 Senior Ari Cohen and Sophomore Jacob Pettigrew play during the Wind Ensemble performance. Photo by Brandon Wong. After the three Concert Band performances, the Wind Ensemble took the stage for 6 songs, some featuring Malden High Band Alumni. Seniors, Renet Chan and Kevin Ochoa presented Mazza with a gift from the band officers. Chan explained that “the officers wanted to get something for Ms. Mazza where she will be able to have a part of [them] with her even after [they] graduate.” They got her a stuffed animal and flowers in case “she needs anything to de-stress,” according to Chan. Chan thought “the concert would run smoothly with minor mistakes,” and in the end it “exceed [her] expectations.” She expressed that the “winter concert is very bittersweet,” knowing that that was her last winter concert with the Malden High Band. The Malden High Band will have another concert in the Spring of 2019 in the Jenkins Auditorium, although the date has not yet been decided.